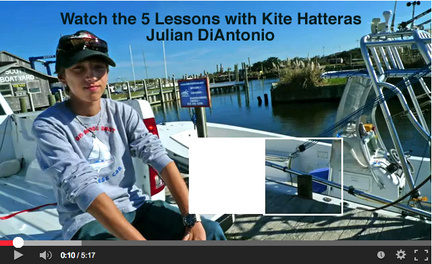 KITE HATTERAS offers the most efficient form of teaching on the East Coast. Ty Luckett’s custom kite boat offers safe and dry comfort as well as launching from the boat with all the equipment you need for any conditions. You will be on the water quickly with kites that are already rigged and a compressor to inflate them. More time for you to learn! We are now using 2-way communication radio helmets. Not only can you hear your instruction crispy clear, but can also talk to one another with out hitting any buttons (hands free). With a certified boat captain, the latest Cabrinha kites and equipment and a boat that is specifically designed for use as a kiteboarding instruction tool, Kite Hatteras offers a lesson program that is unlike any other. 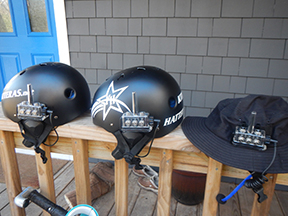 Kite Hatteras is the only company that offers "The Tower”, which provides instruction even in no wind conditions! Focusing entirely on board skills, "The Tower" pulls you out of the water at a 45 degree angle just as the kite will - allowing you to become comfortable with edging and proper foot pressure which are necessities for kiteboarding success. Ty has been involved in the USA kitesurfing industry since its inception. with a commercial pilot's license and is a sponsored rider for Cabrinha. lessons with the highest level of professionalism and safety.